The Fair Housing Enforcement Program at the Legal Aid Society of Hawai`i has reopened and is now accepting applications for fair housing assistance. ​To apply for our services, please contact Legal Aid's Intake line at (808) 536-4302 and press 1. Free Training Offered to Housing Providers & Professionals in April 2019 - Coming to an island near you! Who should attend this free training on Fair Housing? When will it be hosted on my island? Please note that space is limited and attendees must register prior to the registration deadline. Click on the links below and follow the instructions to sign up. April 9, 2019 - Kauai Fair Housing Workshop | Register by April 2nd! April 12, 2019 - Maui Fair Housing Workshop | Register by March 28th! April 15, 2019 - Kailua-Kona Fair Housing Workshop | Register by April 5th! April 25, 2019 - City & County of Honolulu Fair Housing Workshop | Register by April 15th! April 29, 2019 - Hilo Fair Housing Workshop | Register by April 18! Legal Aid's Brochure on Language Access (English) *This brochure is currently being translated into other languages. ​Click here to read Civil Beat's article, "When Not Speaking Fluent English Can Get You Evicted"
On April 7, 2016 Honolulu Mayor Kirk Caldwell signed a proclamation marking April 2016 as Fair Housing Awareness Month. 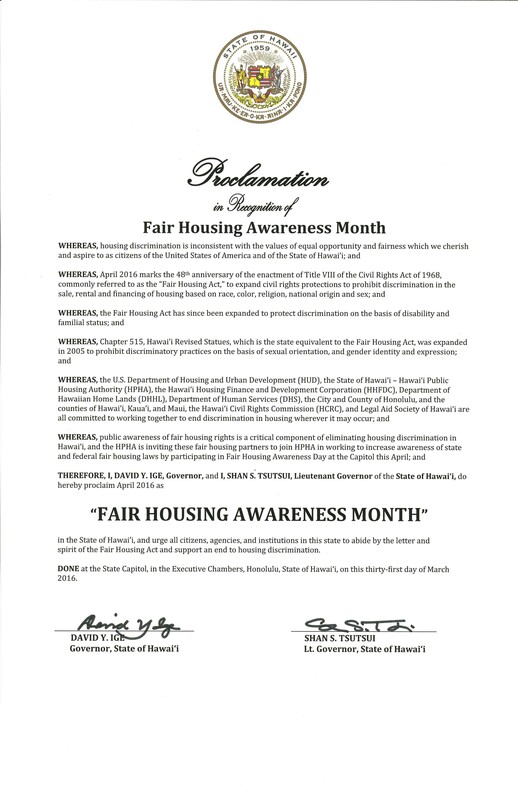 On April 8, 2016 Governor David Ige signed a similar proclamation in recognition of Fair Housing Awareness Month.​ To read the full proclaimation, click here. Fair housing is our kuleana (right and responsibility). Where we live may have a huge impact on the quality of our schools, jobs, health and well-being, access to fresh food, parks, hospitals, and transportation. Mahalo to all of the participants and sponsors for helping the Legal Aid Society of Hawai‘i’s Fair Housing Enforcement Program advance fair housing and end housing discrimination!